Thomas Keller’s Ad Hoc cookbook is now one of my favorites. But, like most of the cookbooks I’ve purchased lately, I tend to read all the recipes but never make a single one. 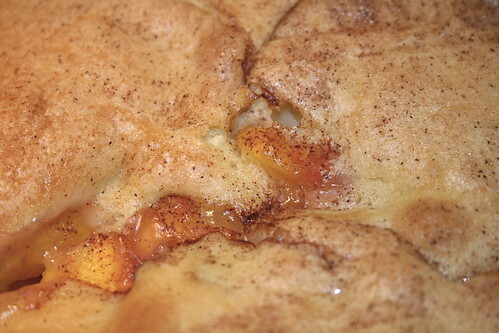 For a recent meal, I decided to give the cobbler recipe in Ad Hoc a try. The recipe is for blueberry cobbler, but since my husband is anything but a blueberry fan, I had to go with peaches. I used seven large peaches, but ten or eleven would have been better. After mixing the fresh sliced and peeled fruit with sugar, a bit of flour, and lemon zest, I poured the peaches into a 9 x 13 inch pan and topped it with the homemade topping. The cobbler smelled delicious as it was baking in the oven. I usually go more for chocolate desserts, but the aromas that filled my kitchen were heavenly and irresistible. 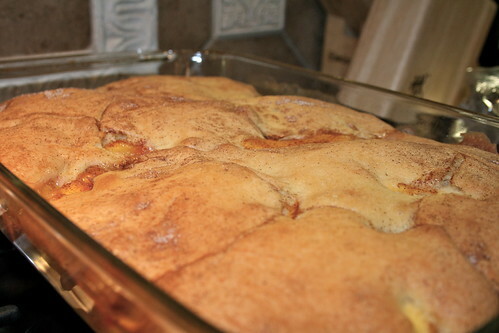 After baking it for 40 minutes at 350 degrees, the peaches bubbled and the topping was golden brown on top. 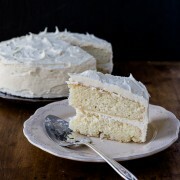 The cake-like topping was wonderful with a subtle sweetness, and the cinnamon sugar topping added a nice flavor to each bite. I didn’t think there was enough juiciness in the fruit, but I can probably remedy this by using more fruit next time around. 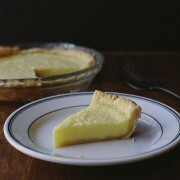 I’m new to your blog but the idea of lemon buttermilk pie brought me here. And then I read your post. My Dad passed away a year ago. We lived on takeout for two weeks while we slept in his room at the hospital. But we are not in the south so didn’t get to enjoy such beautiful food at his funeral. Southern food was my dad’s favourite. Mine too. Hugs. Sending your family peace and best wishes. Bits and pieces made up our lives over the past few weeks. I love this post. Thinking of you all, MJ. We have funeral food for Jewish funerals – and for a full week after that. It’s mostly cold cuts and cake at first, then the casseroles and roast chickens after that. And more cake. It’s at times like these that I feel sorry for people who say “Eat to live, not live to eat.” They’ll never quite understand the warm, comforting hug inherent in a beautiful pie like this one. This beautiful photograph just seems so poignantly perfect. Bright and comforting, somber and serious. 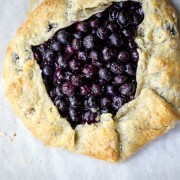 I want to make this pie, now. Thoughts are with you and your family. While there was plenty of food after my parents’ funerals, nothing was homemade. Platters of cold cuts (which I never eat except at funerals) for sandwiches, platters of smoked fishes & fish salads are all the ‘food of my people’. That, in and of itself, makes me feel good. But a little homemade something or other would never hurt. Love this pie, love this post. Love you. oh my! i’m a huge buttermilk fan. this pie looks amazing! I’m from Alaska, originally, and was still living there when my father died. Our neighbors and friends filled both our fridge and freezer with love and empathy in the form of carob cakes and casseroles, pies and baked meats. Not just a Southern thing, but strongly a fortunate thing, and I’m glad you have a caring community around you. May you, your mother, and your family heal stronger than you now believe you can. This pie recipe looks like a “keeper” Jennifer. I'[m partial to custard pies so this looks perfect to me. I’m from the North, and it’s very common here for people to deliver food when someone is very ill or has a family member pass. Recently my neighbors lost their 40+ year old daughter to cancer. I felt horrible for them and didn’t know how to express myself so I baked a huge pan of homemade dinner rolls and delivered them while they were still warm. I think delivering food to someone who is experiencing a loss is one universal way of showing how much we care. I hope your days begin to get easier for you and your family. What a beautiful pie and touching words. You and your family continue to be in my thoughts and prayers. When my grandmother passed away unexpectedly in fall 2012, so many friends and neighbors showered us with food gifts, it was so touching! We were in North Dakota, so it must not be just a regional practice. Grief is such a funny thing… sometimes I wasn’t hungry at all, and other times ravenous. There were so many details to be dealt with and having peoples’ food gifts available was such a blessing. I’m now trying to remember to pay it forward and give food gifts to those grieving/going through illness/have new babies, etc. Such beautiful writing, as usual. I wish you a sense of peace and comfort in the days and weeks ahead. My father passed away at the end of February so your account resonates so much with me. 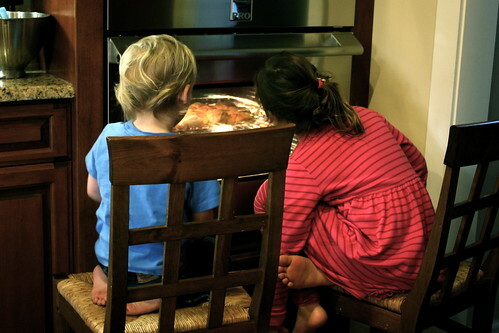 While there wasn’t different food for our family, it was still part of how we cared for each other. My days were similarly broken up between the normal and the demands of the situation. Your pie looks lovely and someday I’ll make it for my family, think of my Dad and your Dad. I know mine would have also loved your pie. Thank you for the gift of your words and your recipe. Funeral food is a church thing up here in the North. I’m so sorry about your dad’s passing, MJ. I don’t have great words in these situations, but wanted to let you know I’m thinking of you and your family. And that pie? I think I’ll make it for someone I love and share the love.